Quincy - Little Dog Brewing Co.
John Quincy McIver, "Quincy," is the inspiration for Little Dog Brewing Co. A rescued Basenji, Q is small but tenacious, focused and determined without taking himself too seriously. He serves as the brewery mascot/logo and his image, created by artist Tom Kerr, can be seen throughout the brewery and on our T-shirts, hats, glassware, etc. Quincy was rescued from a NJ shelter and came to live with Gretchen & Kevin as a 2-year old. He never failed to amuse his adoptive family and led a happy, secure life. Q crossed the Rainbow Bridge in October 2016 at the age of 10. 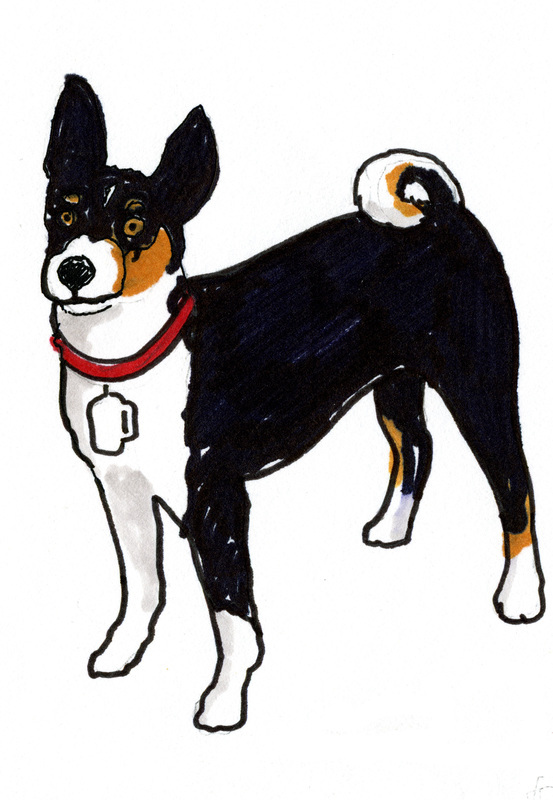 About Basenjis: Basenjis are an ancient breed of dog, more akin to hyenas, wolves and dingos than domestic canines. They are clean, clever and catlike. Basenjis can be difficult - they require a lot of attention and exercise and are not a good choice for inexperienced pet owners. They do not bark, though they are not silent; rather, they yodel, chortle and snort. Quincy doesn't have much to say, although he crows like a rooster every morning. For more about Quincy, The Little Dog, Like him on Facebook.